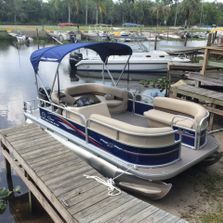 At Boats To You Rentals, you can rent a Party Barge Pontoon boat that you and your companions can use to explore one of the many public waterways around the Orlando, FL area. It’s a great way to spend some quality vacation time under the warm Florida sun. Yet, what exactly are you getting with our pontoon boat rentals? You’re getting a first-class vessel that comes with practically everything you need for your half-day or full-day excursion. Our 2017 Sun Tracker Party Barge 18 DLX is full of amazing design features and comfort-enhancing amenities. Let’s have a closer look at this state-of-the-art boat. The Party Barge pontoon is a 20-feet boat that holds up to nine people, with a maximum passenger weight of 1220 lbs. The boat, powered by a 60 HP engine, can carry up to 1750 lbs., people and freight combined. You have plenty of room to lounge around or do some fishing. The non-skid interior flooring lets you move freely. 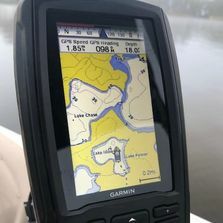 If you are interested in hooking some fish, you can turn on our Garmin echoMAP CHIRP 43cv chart-plotter to help you see what’s happening underneath the boat. The boat also comes with a Bimini top. This is basically a canvas over the boat that can be set up or put away as needed. People often use it for protection from the rays of the sun during especially hot days, so you can enjoy your vacation without getting scorched. Your pontoon boat rental is certified by the National Marine Manufacturers Association (NMMA), which indicates that the vessel meets the quality standards of the U.S. Coast Guard, as well as the American Boat & Yacht Council. 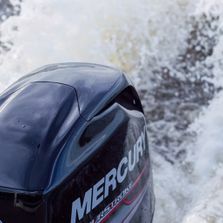 We always ensure that our boats are clean, full of fuel, and in excellent working condition. If you prefer, your boat will also come with captain service for an additional fee. 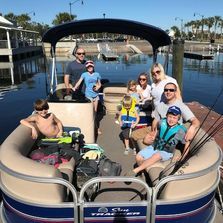 With Captain Mike at the helm, you’ll be able to turn your full attention to fishing, partying, listening to the built-in stereo, or whatever else you feel like doing. A great vessel and excellent customer service—it’s all yours with our affordably priced party boat rentals! Fish–finder, chart–plotter, depth–finder, water-proof, weather–resistant, large screen, and user-friendly. See full gallery!